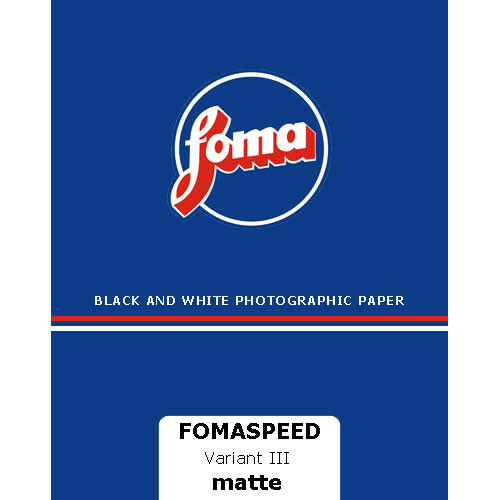 Flexible and versatile, this 25-sheet box of 8 x 10" Fomaspeed Variant 312 VC RC Paper from Foma features a matte finish along with an easy-to-handle resin-coated base. Its variable contrast designation permits working with multigrade filters for adjusting contrast during printing, to suit a range of negative densities, and the paper supports a rich halftone scale with bright whites and deep blacks. The paper also features a silver chlorobromide emulsion, which provides a neutral to medium-warm tone depending on processing techniques, and the paper is receptive to both direct and indirect toning methods. Box Dimensions (LxWxH) 11.0 x 7.0 x 0.4"
Fomaspeed Variant 312 VC RC Paper (Matte, 8 x 10", 25 Sheets) is rated 4.5 out of 5 by 2. Rated 4 out of 5 by Pinhole prodigy from Fast paper I used this paper in a pinhole camera. Most rc photo papers are rated at ISO 4 but this one is rated at ISO 5. It helped shave a few seconds off my exposure time. I contacted the company foma via email and they got right back to me unlike the other photo rc paper manufactures who i still haven't heard from. Rated 5 out of 5 by Anonymous from I would buy this product again and again The product is very easy to use and develops rather quickly. I love the matte finish and I couldn't have asked for a better product.